An ebullient President Trump flew home Tuesday with what he called a “very, very comprehensive” agreement with North Korea, even as lawmakers, analysts and allies congratulated the effort but questioned the substance of what had been achieved. The brief document signed by Trump and North Korean leader Kim Jong Un provided virtually no detail beyond a stated commitment to “denuclearize” the Korean Peninsula, a promise that Pyongyang has made and ignored many times in the past. Talks are to be led on the U.S. side by Secretary of State Mike Pompeo and, according to the agreement, a “relevant, high- ­level” North Korean official. But no specifics of a future path were outlined. There was no mention of a declaration of North Korea’s nuclear assets, which normally precedes any arms control negotiation, or of timelines or deadlines. No sanctions will be lifted until denuclearization reaches “a certain point,” Trump said without elaboration. “They’ll come off when we know we’re down the road,” he said. But Trump said at his news conference that he would cancel U.S.-South Korean military exercises, which he described as “very provocative” — a description often used by North Korea. The announcement appeared to take both Seoul and the Pentagon by surprise. “Our alliances remain ironclad, and ensure peace and stability in the region,” Pentagon spokeswoman Dana White said in a statement hours later. The summit, she said, was the “first step along the path to the goal” of denuclearization and peace on the peninsula. South Korea said it was studying the president’s remarks from the news conference. One of the two annual large-scale exercises between the two took place this spring; the next is scheduled for August. 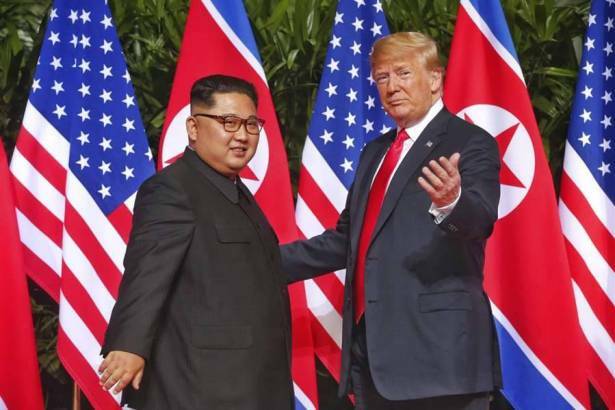 North Korea’s tightly controlled media hailed the “meeting of the century,” as the official state newspaper, Rodong Sinmun, put it, but framed the coverage around the premise that it was Trump who was most eager for the summit. The North’s official KCNA news agency characterized Trump as conceding to Kim’s demands to suspend U.S.-South Korea military exercises. Rodong Sinmun described the summit accord on denuclearization as a “step by step” process with reciprocal moves by the United States. The account appeared to be at odds with remarks by U.S. officials that no major concessions can occur before the North makes significant progress on dismantling its nuclear program. There was some discussion of human rights during the meetings — which included a one-on-one between Trump and Kim, an expanded session with senior staff on both sides, and a lunch — Trump said, but they focused primarily on nuclear issues. Neither North Korea’s brutal treatment of its own citizens, nor its substantial cyberwar capabilities, nor Japan’s request for a tough line on the abduction of its citizens, was mentioned in their joint statement. Trump did secure Kim’s promise, stated in the written agreement, to restart the return of U.S. military remains from the Korean War. That process, begun in the 1990s, was suspended in 2005 as tensions rose between the two countries. Unlike decades of previous arms agreements, which usually start with bottom-up negotiations and final deals sealed by leaders, this one began at the top. Trump made clear that his presence, and his self-described dealmaking skills — along with a slick, U.S.-made video depicting Trump and Kim as key to saving the world — were part of the negotiation itself. By forming what he called “a very special bond” with Kim, he said, he would be able to achieve a success that had eluded several presidents before him. From the outside, against the spectacular tropical background of the Singapore city-state, all was bonhomie and preset photo opportunities showing the 71-year-old U.S. president, and the 34-year-old leader of the world’s most isolated and repressive nation, smiling and chatting. Some experts questioned, however, what happened during the talks themselves, and whether failure to reach agreement on vital issues during pre-summit talks led by Pompeo left the president with little leverage to press Kim. But while the agreement refers to “a lasting and stable peace regime,” it does not mention a possible official end to the Korean War or normalization of relations. Lawmakers were largely divided along party lines, with Democrats saying they were all for peace but that Trump may have gotten snookered. Republicans were generally congratulatory, while reminding Trump that Congress must be kept apprised of what the administration is doing and of his promise to submit any final deal for approval. Sen. Tom Cotton (R-Ark.) compared the summit to past presidents sitting down with the Soviet Union. While there was “some validity” to the thought that a U.S. president should not sit down with “two-bit dictators,” he said, North Korea’s possession of nuclear weapons had changed the equation. In terms of what must come next to demonstrate Pyongyang’s seriousness, “the real test will be when Pompeo has to follow up on all this,” said Michael J. Green, who served as Asia director for President George W. Bush’s National Security Council during the last extensive round of North Korea talks. Declaration of nuclear activity would also have to include suspension of “all nuclear activities, including plutonium reprocessing, uranium enrichment and missile production,” said Frank Aum, senior North Korea expert at the United States Institute of Peace. Verification and monitoring of denuclearization can be done by the International Atomic Energy Agency — the same international organization whose certification of Iranian compliance with that nuclear deal was questioned by Trump. However, “the IAEA does not touch nuclear weapons,” Green said. Dismantling and destroying North Korea’s nuclear program would likely be done by Pyongyang itself, supervised and assisted by a consortium of military experts from the United States and other nuclear powers. Once weapons and fissile material is shipped out of the country — most likely to China or Russia — “they chop up and destroy the centrifuges,” Green said. Before any of this happens, however, Pompeo must assemble a full team of experts. “He’s got some of those, but I don’t see the nuclear physicists, the weapons experts that you really need to do this kind of negotiation and not have the wool pulled over your eyes,” said Wendy Sherman, the former undersecretary of state who led the U.S. negotiating team with Iran. Philip Rucker, Anna Fifield and Anne Gearan in Singapore and Brian Murphy in Seoul contributed to this report.